The Borden Building “tower,” which would be repaired and repainted. 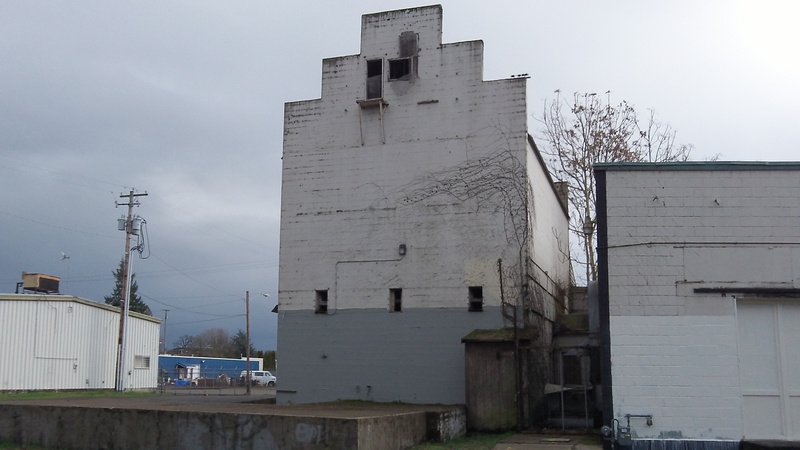 A couple of structures in east Albany could get a new look with help from urban renewal funds if the city grants their owners’ requests. The proposals are on the agenda for review when the Central Albany Revitalization Area advisory board meets at 5:15 p.m. Tuesday, March 4, at City Hall. — Owner John A. Boock is asking for $4,500 to cover half the anticipated cost of painting the tower portion of the Borden Building at 635 Water Ave. N.E., site of the Delux Brewing Co. The exterior door and window openings would be repaired. The Allen Insurance building on Third Avenue. –Michael D. Allen is asking for $5,000 toward the estimated cost of $11,500 to fix up his building at 433 Third Ave. 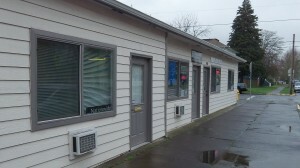 S.E., the home of Allen & Associates Insurance Inc. The proposal calls for removing five air conditioning units mounted in the walls, replacing the siding where required, adding a 3-foot stone fascia around the bottom of the exterior and repainting the building. Also on the agenda for the CARA board meeting is a review of potential public infrastructure projects on which the program might spend up to $3.1 million. “Streetscape improvements” along Water Avenue and Main Street and dressing up the Thurston Street canal, among other projects, have been suggested by the city staff. Competing with that idea is the suggestion, aired at a recent meeting of the citizen review board for police and fire facilities, of spending the $3 million toward construction of those public facilities, which would lower the amount of a potential bond issue. Here we go again. Any cycle of legalized cronyism where a few are given special favor at the expense of everyone else. The crony relies on the coercive power of government to tax. The crony depends on subsidies in the form of grants and forgivable loans. The crony enriches himself and grows his wealth by accepting money not earned. The crony exploits his connections with city hall to obtain city-provided advantage. Legal plunder is their lifeblood. They make money the modern way – hand out and palm up. As long as the city remains flush with money to give away, taxpayers need to challenge the city’s spending priorities. Taxpayers also need to shame the cronies when they come begging. Hire some high school kids to paint while on their summer vacation. Keep some teenagers busy and out of trouble and the owners won’t have to “beg” for money. Personally, I won’t support any business that “begs”! I’m sure that when CARA needs support for ravaging the Albany populace, the people who have received these funds will gladly step up. Let’s see…spruce up Thurston St. canal, do some streetscapes… or help build a fire station or a police station. Which is more important to the people? FIRE STATION AND POLICE STATION! OMG! We shouldn’t even have to discuss which is more important. This probably has nothing to do with CARA but, I’m still wanting to know who takes care of the streets in downtown Albany. Third Street running past Albany Christian School is a disgrace. Do drivers ignore the streets on their way to spend money downtown? The street running past Ciddici’s Pizza is another teeth rattling one.